Born in 1952 in Menofeya, to a family with numerous members in senior government service, Magdy Abdel Ghaffar graduated from the Police Academy in Cairo in 1974. He spent the first three years of his career serving in the Central Security Forces, then joined the State Security Investigations Service in 1977, where he would spend upwards of thirty years. At the time, State Security was the largest domestic intelligence agency in Egypt, with its own network of spies, officers, prisons, and courts. Abdel Ghaffar rose through the ranks, holding a variety of positions; he was at one point the Cairo director of the agency’s counter-extremism division, and he reportedly was involved at a high level in the government’s handling of the terrorism of the 1990s, including countering Gamaa Islamiya. In 2008, Abdel Ghaffar left State Security for a position in the Interior Ministry’s port security division, where he remained until March 2011. Following the January 2011 uprising that forced President Hosni Mubarak to step down, protesters increasingly targeted State Security and other Interior Ministry organizations that had long suppressed dissent and clashed with demonstrators. In early March, several State Security buildings were overrun by protesters, including the headquarters in the Cairo suburb of Nasr City. Shortly thereafter, then-Prime Minister Essam Sharaf and Interior Minister Mansour al-Essawy—both had been in office for less than two weeks—announced the dissolution of State Security and the creation of a new national security apparatus. (This organization is sometimes referred to as the National Security Agency; while that is an accurate translation of their Arabic name, they style themselves in English as “Homeland Security,” and will be referred to here as Egyptian Homeland Security, or EHS.) Abdel Ghaffar was appointed the new agency’s first deputy director in March 2011, with Gen. Hamid Abdullah as the director. At the time of his appointment, government figures—including serving officers in various branches of the interior ministry—publicly proclaimed the need for reform within the intelligence and interior ministry apparatus. In a television interview in 2011, Abdel Ghaffar insisted that Egyptian Homeland Security was “not a clone” of State Security and that deep–seated changes were being implemented. He acknowledged that State Security had broken the law and engaged in “incorrect practices,” but defended its intentions, saying it was to protect the country from terrorism and other harm. In December 2011, Abdullah retired, and Abdel Ghaffar succeeded him as director of EHS. Abdel Ghaffar continued to trumpet the reforms that were being made, calling EHS the “legitimate son of the January 25 Revolution” and referencing abusive practices that had been stopped since his arrival. As he was approaching the statutory retirement age, plans were announced in June 2012 for Khaled Tharwat to succeed him. Abdel Ghaffar left EHS in January 2013 after a little more than a year in the top office and almost two years in the agency. While much had been made about the need for reform in EHS, most observers agree that the change from State Security has been merely superficial. In March 2015, Abdel Ghaffar was plucked from retirement to succeed Mohamed Ibrahim as minister of interior following Ibrahim’s dismissal. 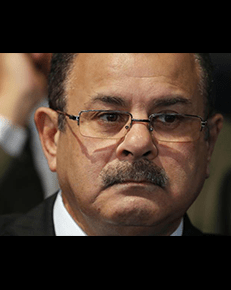 Abdel Ghaffar was replaced by Major General Mahmoud Tawfiq in June 2018 in a cabinet shakeup at the start of President Abdel-Fattah El Sisi’s second term, though Abdel Ghaffar was appointed a special presidential adviser for counter-terrorism. In April 2012, Abdel Ghaffar allegedly complained to the Kuwaiti newspaper Al Jareeda that the American University in Cairo was “serving a foreign agenda” and had supported protesters in street clashes in 2011. He said the quotes in question were fabricated, but other security sources told Egyptian media that AUC was suspected by Egyptian intelligence agencies of supporting other groups and was subject to close monitoring. Shortly after his appointment as interior minister, Abdel Ghaffar promptly replaced twenty assistant ministers, then several other senior officials in April that year. Many of the new officers appear to have backgrounds in State Security and EHS rather than the Central Security Forces; all interior ministers after Mubarak’s fall and before Abdel Ghaffar’s ascent were CSF officers. Notably, Abdel Ghaffar demoted former CSF director Major General Shoaib Siaam; Siaam appears to be out of office following the latest restructurings. Other shuffles of officials in the ministry during Abdel Ghaffar’s tenure as minister also reflected a promotion of State Security and EHS officials.